[Jakarta, LTTW] The 2015 Nepal quake hit on April 25. Measured at 7.8 magnitude on the Richter scale, it is the most devastating earthquake to hit Nepal since 1934. Recovery efforts on the aftermath of the Nepal quake continue, as the death toll surpasses over 7000 dead this week. Relief has arrived from the international community, in addition to local efforts. The Nepalese government had initially been “overwhelmed” by the situation, unable to meet much of the demands from casualties. This has lead to protests on April 30th in Kathmandu demanding better & faster relief, although as of May 3rd, efforts have sped up. 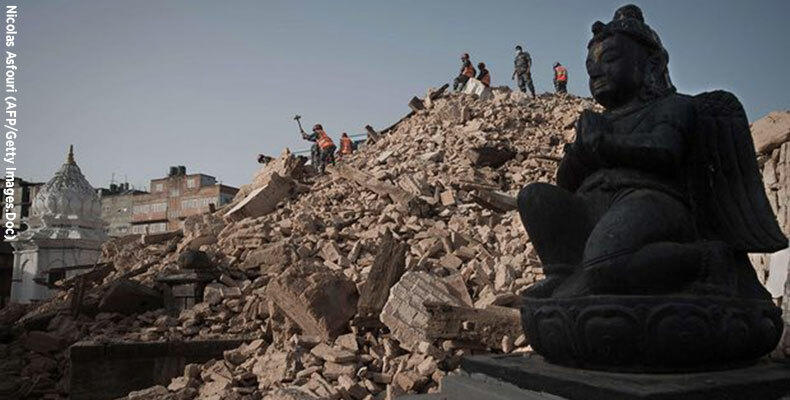 Nepal has now begun to assess its losses to cultural heritage sites & monuments. Many monuments, some of them centuries old, have been ruined but there is still hope that these sites can be rebuilt. “Once every hundred years an earthquake has destroyed the palaces and temples but our kings always restored them. That we can do,” Kunda Dixit, editor of the local Nepali Times, said. After the last major earthquake in 1934, many buildings had to be rebuilt. Local historian & conservationist Rohit Ranjitkar was confident that the damages this time would also be restored. “This is our heritage. This is our duty,” he said. Based on past experiences, the role of culture in post disaster recovery efforts has often been overlooked and underrated; it’s somehow perceived as something “insignificant”. This is regrettable, because arts (as one of cultural manifestations) are actually a self-reliant supportive system in human life. So well-programmed art activities can be instrumental in healing communities from the trauma. Immediately after the 2004 Boxing Day Earthquake (that hit the Indonesian province of Aceh, Thailand and up to Sri Lanka, then followed by the second worst tsunami in history), UNESCO Jakarta Office and Sacred Bridge Foundation initiated and carried out a series of Cultural Healing program in Aceh, Indonesia, the worst hit area suffering a death toll of over 250,000. The programs, called Rising Above the Tsunami and Gaining After the Tsunami, assisted the people of Aceh to regain their dignity and life spirit, and rebuild their lives by utilizing their own arts, dance, music. This series of program was recognized as the intangible effort with tangible output. The people of Nepal is facing perhaps the most difficult period of their lives, so they would need every mean to overcome the situation as soon as possible, and we have the obligation to assist in the best possible way. So perhaps, a cultural healing initiative can help our brothers and sisters in Nepal to rise above the tragedy in the nearest future. Listen to the World’s former chief editor. As a graduate of Communications Sciences, University of Indonesia, he has dabbled over the years in graphic design, TV-Script translation, advertising copywriting, and many more. He is currently involved with a local Indonesian tech news website.